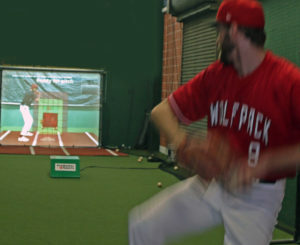 Since 1999, ProBatter video pitching simulators have become the industry leaders for baseball, softball and now cricket. They are truly the Ultimate Training Tool for hitters in these sports. 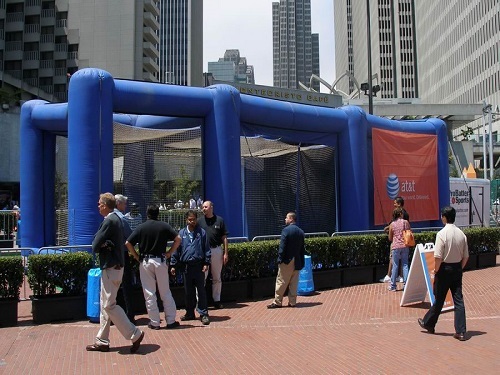 In addition, our promotion and fan entertainment packages, which feature a ProBatter simulator and an accompanying batting cage, has proven to be an excellent way to not only amuse fans both before and after games but to actually attract them to the parkand they are excellent vehicles for promoting one’s brand. At the core of each simulator is a high-tech, commercial pitching machine that can throw virtually any pitch that a pitcher (or bowler) can deliver; a larger video projection screen on to which is projected video HD quality images of actual pitchers and cricket bowlers; and a touch screen controller that is not only attractive, but easy enough for even the bat boy to use. The result—a line of products that have been universally accepted at all levels of the sports. Our mobile units allow your customers to hit against video images of actual pitchers throwing a variety of MLB-type pitches or pitch to simulated batters using real baseballs. You can create your own Power Hitter and ProPitcher competitions to increase traffic and excitement for your brand or event. Sponsors can run their advertisements between rounds on our large video screens with state of the art video and sound. WHAT IS IT? Strike Out Pro™ is a new, hi‐tech pitching system that displays the video images of actual batters on a projection screen with portions of the strike zone highlighted as “hot zones” for the pitcher to try to hit. Both right‐handed and left handed batters can be displayed and the hot zones can be varied from batter to batter using a wireless tablet. At the end of the session, the speed and accuracy of each pitch are displayed on the tablet and e‐mailed to the user and/or their coach. WHO IS IT FOR? Strike Out Pro is ideal for pitcher training at all levels as well as for fan use at stadiums, amusement and entertainment venues and fan zones. HOW MUCH IS IT? Special Introductory price of $12,995. The ProBatter PX2 Video Simulator has been a valuable tool for our hitters. Seeing different pitches at varying speeds will prepare them well for live action. Installing the ProBatter products was a great decision. They’re generating three times the revenue of my other machines. I cannot conceive of a better way to prepare my players for competition in a game. We sincerely believe that with ProBatter we have a real advantage over the competition.